Once upon a time in 1953 it was dangerous to be a "Progressive," a euphemism for a Communist, of whom there were many among the Jewish population in New York, especially in Brooklyn. A member of the community by birth, a brash, non-stop talker named Rose (Kala Savage), tries to wriggle out of the trap she sees being prepared for her by her Progressive parents. They expect her to help change the world, at least to the extent of combating anti-Semitism, then grow up enough to work at supporting the party. It’s a fair goal that Rose nevertheless feels as suffocating. She wants out of their all-consuming political commitment, whereas that’s the source of vitality that Jules Feiffer finds missing from our world. The play expresses Feiffer’s nostalgia for a time when belief in a cause larger than the self was possible, if not typical, and Rose is his test case. But dedication to principles is not an unequivocal good in this play. The self righteousness of the parents is wearying, the catch words for anti-capitalism and activism feel stale, while Rose’s antagonism to her parents makes her small. She is quick and might have been sympathetic if her adolescent warfare was not being waged against basically good people, mother Naomi (Jan Maxwell) and father Shelly (Jonathan Hadary). Anger and frustration drive her to stomp up and down the Brooklyn Heights Promenade, where she spills over to a modest, middle aged painter called Emil (Larry Bryggman). His talk calls up most of the play’s cultural references: Theodore Dreiser&#150;he gives her copies of An American Tragedy, Clifford Odets, High Noon. In fact, there was a deluge of film, play, novel and poem during the ‘fifties making Jews visible to the WASP establishment. The moment, however, also coincided with the malevolent investigations of the House Un-American Activities Committee, who knew that the place to look for political consciousness of any stripe was among the Jews. Rose does not foresee the potential danger of her self absorbed conversations with another habitue of the Promenade, a smooth talking FBI agent called Fallon (David Harbour) gathering information about her parents. The results are predictable, though they wait until Act II to gather emotional shape and force as a conflict between Rose and her mother. 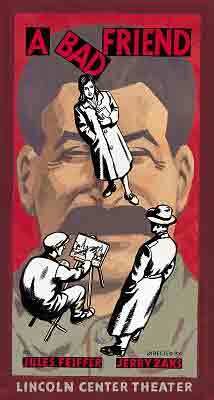 When Stalin dies and the world learns of his pogroms against the Jews in Russia, Naomi’s world collapses. It is the &#145;seventies: Rose is long gone and married; Shelly is dead; and the motive force for Naomi’s passionate idealism has been stripped away. Jan Maxwell makes Naomi’s abandonment deeply sad. The historical setting of her disillusionment may not have spoken to many in the audience (perhaps still fewer had lived through the &#145;fifties) but the painfulness of her belief crumbling away into ideology transcends particular experience. Maxwell’s honesty as an actor made the role bigger than its summary here implies. Her intensity in Part I is compelling, its loss in Part II is equally so. None of the acting rose to her level and it is not a big play. Theatrically speaking, it’s rather bare&#150;basically consisting of a series of Rose’s encounters against a backdrop of the Manhattan skyline. It looked like the best part of Brooklyn.